A little fir tree is planted in a forest but, cramped for space, grows lopsided, unlike the other trees which grow tall and strong. One December the little fir tree is cut down along with many of the other trees and taken to the city to be sold. Although the other trees quickly find homes, no one seems to want the little fir tree, until, just as the shops are closing on Christmas Eve, a small boy asks the shop keeper if he can have the little tree no one else wants. The little fir tree has an unexpectedly joyful Christmas with an unlikely group of people and afterwards finds a permanent home in a park where he grows strong and sturdy, enjoyed by everyone. 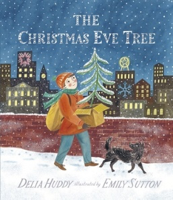 This is a delightfully illustrated Christmas story, reminiscent of Hans Anderson’s classic tale, The Little Fir Tree in which we meet some unexpected characters living on the city streets. A story which explores the idea of the spirit of Christmas; that goodwill, caring and fun is more important than expensive presents. The importance of looking after living things is included too; even weak looking plants can thrive if cared for. Before you start reading the story talk together about the cover illustration and what might happen in the story. Read the beginning of the story aloud, pausing to talk about the illustrations. Can you spot the little fir tree in the forest? Talk about what you can see in the shop window. Pause again after the boy is given the fir tree, and has planted it in a box. What would children like to happen next? After you finish the story, ask children if anything surprise them. They may wonder about people living on the streets for example. If they are anxious about the homeless boy you could talk about what they would like to happen to him after the story ends. Share your favourite parts of the story/or favourite illustration. When you read the book again children could join in with parts, for example the page which shows what happens to all the trees and the conversation between the shop keeper and the boy. Paint a picture of the Christmas tree. When it is dry decorate with small shapes cut from colourful or shiny paper. Find a small branch from a fir tree or twig from another kind of tree. ‘Plant’ it in a flower pot with earth or sand and make decorations to hang on it, perhaps from scraps of shiny paper. Draw a big map of the places in the story showing the little fir tree’s journey from the forest to the city and the park. Go to the local park together and talk about the trees you can see. What kinds of trees are there? (*See the forestry commission guide link below) Are there any like the little fir tree? Perhaps you could make up a story together about one of the trees together.